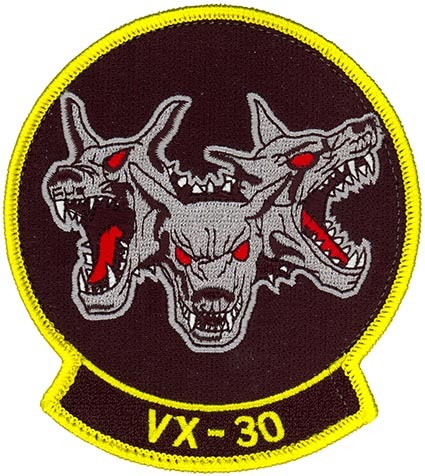 Established in May 1995, VX-30 is a weapons test squadron whose mission is to provide research, development, test, and evaluation of manned and unmanned fixed and rotary wing aircraft and weapons systems. VX-30 also provides support to the Sea Test Range, both locally and worldwide. The Bloodhounds and their sister squadron, Air Test and Evaluation Squadron THREE ONE (VX-31), make up the two components of the Naval Test Wing Pacific. The Naval Test Wing Pacific is a component of the Naval Air Warfare Center Weapons Division (NAWCWD). To accomplish its mission, VX-30 operates a diverse inventory of aircraft, including the NP-3D Orion, P-3C Orion and KC-130T Hercules. VX-30 has been designated “the responsible test organization” and has recently acquired several unmanned aerial systems, including Scan Eagle, Ranging and Velocity Navigation (RAVEN), and Integrator. Bloodhound aircraft accomplish range surveillance, photometric support, area clearance, and airborne telemetry on the Naval Air Systems Command Sea Test Range. Project officers lead several weapon system developmental test programs for the Fleet. The Range Department operational specialists are responsible for safety of flight and range clearance for the 36,000 square nautical mile Sea Test Range. The Airborne Threat Simulation Detachment routinely deploys worldwide to meet unique weapon testing needs at remote ranges and to provide Fleet support. The squadron is poised to continue supporting the Sea Test Range and NAWCWD weapons testing while assuming the responsibility for unmanned aerial systems developmental testing.